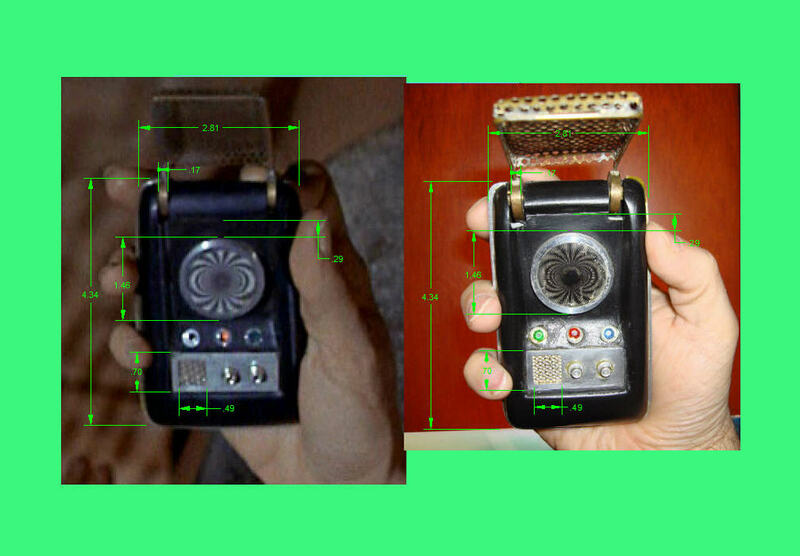 This article will present technical data to support the authenticity of an Original Series communicator hand prop that has been in my memorabilia collection since February 1998. 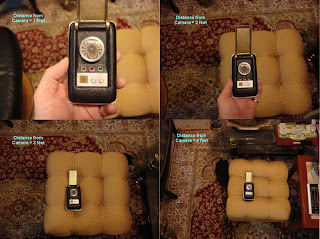 This communicator has been in my possession continuously for the last 10 years with the exception of an 8 month time frame between 7/06 and 3/07; during which it belonged to a well respected Star Trek expert and private collector who performed a slight refurbishment to the prop by removing excessive glue deposits between the top plastic vacuuform shell and the aluminum midplate which considerably improved the aesthetic appearance of the item. 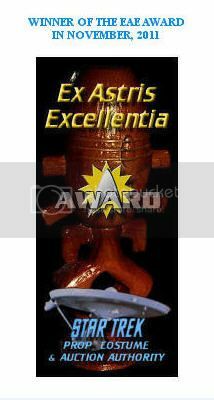 The collector indicated that the refurbishment was performed on a recommendation from renowned Star Trek collector and model maker Greg Jein, who viewed photos of the communicator around August 2006 and mentioned that the excessive glue deposits which were clearly present on the piece were indicative of a repair operation being performed at some point during production, and were possibly indicators of multiple repairs. 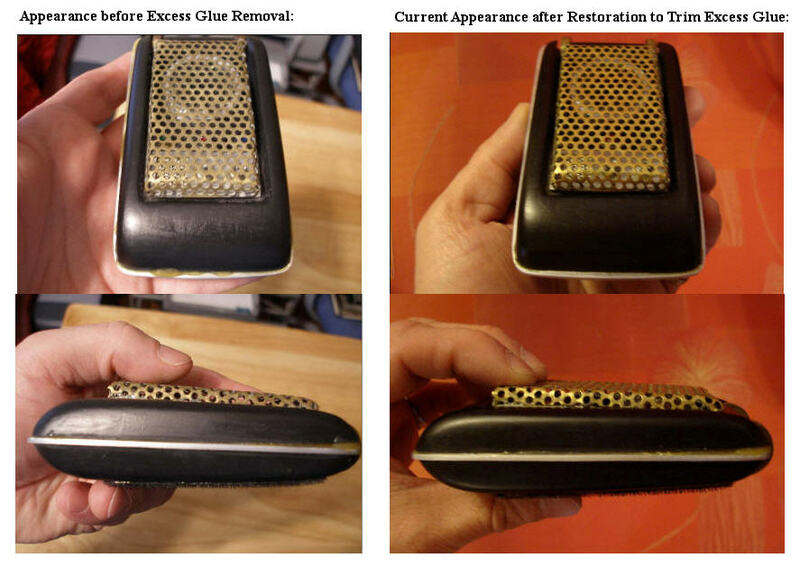 It was mentioned that Greg Jein himself has trimmed excess glue from a couple of items in his Original Series collection which were untidily reassembled after repair and has even repainted TOS props to subtly restore them to their original production state without fear of adversely impacting their intrinsic value. The photograph below shows the appearance of the communicator prior to the slight restoration operation as well as its current appearance. AUTHENTICATION ITEM 1: Evidence of Production Repairs Performed. As Greg Jein indicates, messy or excess glue deposits are not a disqualifier for prop authenticity. In TOS they would imply production repair activity. 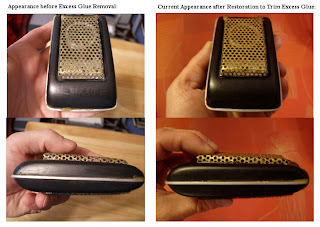 A close examination of the glue visible in the side view photo above clearly shows 2 different adhesive colors (a dark and a much lighter shade of glue) implying 2 different times that the communicator was opened for repair). Presented below is a photo of my communicator with the one that is currently part of the Paul Allen Collection – currently on public display at the Science Fiction Museum in Seattle, WA. This photo was taken in the home of Star Trek (1966-1969) Set Decorator John Dwyer. And a second photo of both pieces also taken in the home of John Dwyer. Expected evidence of age on brass antenna components observed to be consistent between Allen and Gurian communicators. 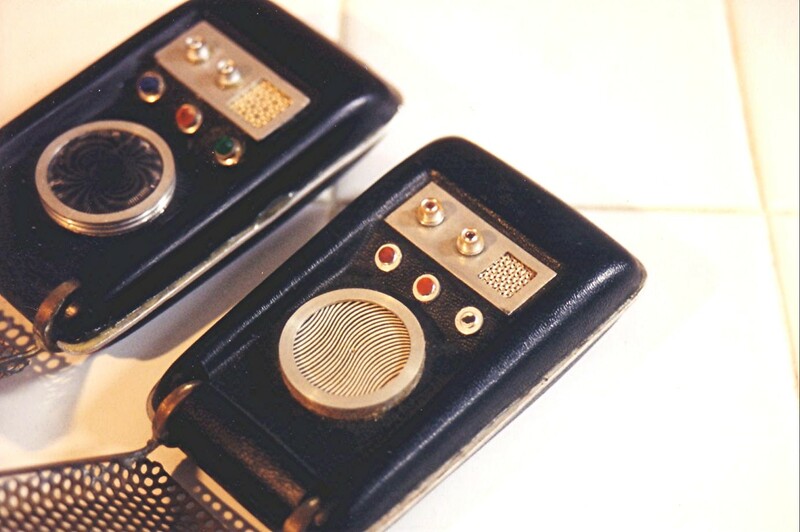 It is quite evident when considering the following closeup view of the communicators side by side that the bronze colored wheels of the antenna assemblies and the visible portions of the antenna mesh and frame on both pieces have identical tarnish discoloration and signs of aging, with a somewhat darkened patina. Antenna aging should not be considered a disqualifier of prop authenticity; but is a naturally occurring phenomena on TOS items from the ‘60s. The degree of aging would be significantly affected by the storage conditions (eg. Shoebox versus Garage) and other considerations such as climate and humidity. The Allen and Gurian pieces demonstrate equivalent storage conditions. A measurement may be made on each piece of the total length of the top black plastic shell: starting at a common reference location (right at the point where the shell edge line intersects the outside bronze wheel surface) extending along a dimension line to the other end of the shell where the boundary line between the black plastic of the vacuuformed piece meets the aluminum midplate. Since the measurement lines are physically located very close to one another spatially, (near the surfaces of the two props that are separated by just a fraction of an inch), the effects of measurement distortion due to perspective will be negligible. The following annotated photograph was produced using a computer-aided design (CAD) software to automatically measure the length of the shells. Note that the photo was intentionally left unitless, so that the values listed would enable a direct comparison of the size of the two pieces; but would not necessarily reflect actual distances in British or Metric units. 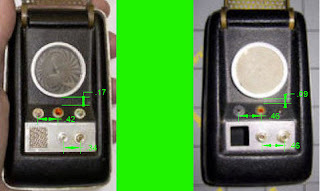 The above baseline length measurement of the Allen and Gurian communicators, determined from a photo of both pieces sitting side by side, establishes an identical length for the black vacuuform top shell; which is an important validation milestone. The next series of measurements was taken on a composite photo; consisting of an image of the Allen communicator on display at the Museum of Science Fiction in Seattle, and an image of my communicator which was held at a slightly declining angle away from the camera to simulate the vertical position of the Allen prop. (My dog insisted on participating in this photoshoot!) The images of the communicators were scaled so that one measurement – the vertical height of the brass antenna – would be equal. (The excellent vertical alignment of the antennas in the photos greatly facilitated correct scaling.) Several other dimensions were then generated with the CAD software to provide insight on the relative sizes of several other components of the two props. As a result of this analysis, 5 different communicator reference distances are now comparable - the antenna length, the antenna hole diameter, the moiré ring diameter (measured along the unbiased vertical axis of the photo), the plastic shell length, and the metal control panel width – and are concluded to be an identical match between the Allen and Gurian pieces. Using a scaled composite photo, 5 different subassembly lengths are found to be identical between the Allen and Gurian communicators. With confidence that my piece was dimensionally correct with a very high degree of precision, I then turned to the filmed footage of The Original Series to determine if I could detect in the episode screenshots any unique design characteristics or construction details onscreen that perfectly matched the appearance of my prop. When considering which design characteristics were most likely to have remained undisturbed over a 40 year period since the last TOS episode was filmed; I considered the condition in which the surviving communicators with impeccable provenance were recently photographed/documented. 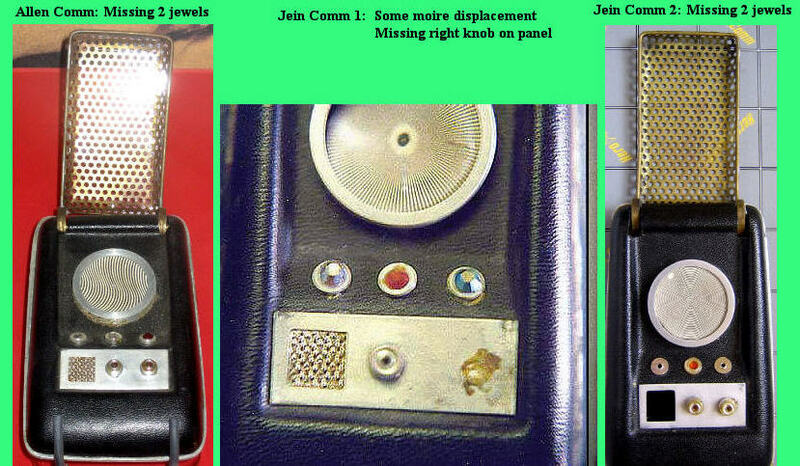 Thus, in consideration of all of these missing details observed on just a small number of surviving communicators ; it is reasonable to say that jewel and knob positions/colors and possibly moiré patterns/positions could easily have been changed/modified during normal use of the props on the Desilu soundstage or in the ensuing decades. 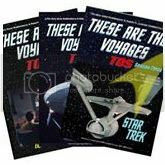 So, the characteristics of these items, as they might appear today on surviving pieces; should not necessarily be assumed to identically reflect their last on-screen TOS episodic appearance. Missing jewels, broken off knobs and torn moiré might reasonably have been the cause of one or multiple repair operations on these props during production or as refurbishment activity later on. Or missing jewels that were displaced late in production might never have been replaced. (It should be remembered that the jewels and knobs were only millimeters in diameter; and thus fragile in comparison to other more sturdy aspects of the communicator design – such as shell and moiré bezel construction and antenna wheel-axis fabrication and orientation – whose unique design features or fingerprints should reasonably be expected to persist. The photo below of the disassembled top shell of Jein Comm2 reveals that, on this piece, the silver metal moiré ring or bezel was actually embedded into a perfectly matching sized hole cut into the shell. My communicator also features this design characteristic; though, this is not sufficient evidence to suggest that all authentic communicators were constructed this way. A much larger sample set would be needed in order to draw any meaningful statistical inferences. With this in mind, the following analysis was performed. The width of the aluminum metal midplate. The width of the left brass antenna wheel. The height of the moiré bezel as measured from its visible boundary next to the black shell body. The height of the metal control panel. The width of the microphone grill. The distance between the top of the moiré bezel and the beginning of the rounded edge of the black shell. Measured at 0.29 units. 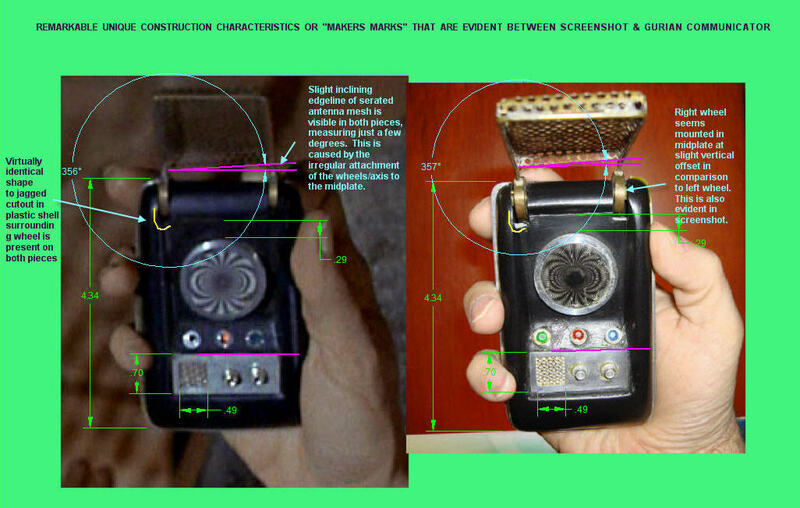 Note 1: It was remarkable that Distance 7 turned out identical since the location of the moiré on the front shell of the communicator would be subject to manual assembly variation (the propmakers seemed to try to similarly locate these on the flat upper half of the shell; but such a precise match to a screenshot was unanticipated.) A example of some of the variation to be observed in the placements of the control devices such as knobs, jewels and moiré bezels is seen in the photo below of the Alpha and Zeta communicators. Note 2: Also remarkable was the identical measures (and thus an identical ratio) observed on the width of the aluminum cutout for the microphone grill versus the width of the aluminum control panel. On both the Omega Glory screenshot and my piece, grill widths of 0.49 and panel widths of 0.70 were observed, for a ratio of 0.49/0.70 = 0.7 exactly. These relative sizes (the ratio) are visually observable to vary sometimes significantly between the screen-used pieces. As an example, consider the Allen and Jein communicators in the following measured photo. 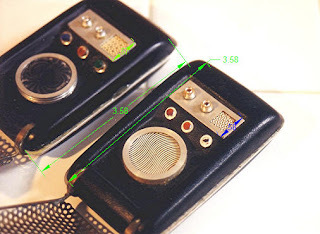 The ratio for the Allen communicator on the left is Mic width of 0.56 divided by Panel Width of 0.99 = 0.57. Similarly, the ration for the Jein communicator on the right is Mic width of 0.58 divided by Panel Width of 0.92 = 0.63. Both the ratios of the Allen and Jein pieces are significantly smaller than the Omega Glory screenshot ratio of 0.70 (which means the relative size of their Microphone grills compared to the aluminum control panel size is smaller , which is certainly perceptible to the naked eye), and it should be noted these ratios are different between all 3 pieces – making it quite interesting that my piece identically matched the Omega Glory ratio. Some further remarkable matches in what might be considered to be construction errors or slight misalignments during fabrication are also observable on the screenshot communicator and my prop. If these are not deemed significant enough tells to establish a positive id of my plastic shell and antenna wheel mechanism with the screen-used prop; then they are certainly extremely powerful evidence of the work of the same craftsman/propmaker. The serrated edgeline of the bottom of the punched antenna plate itself is observed to be inclining slightly upwards at an angle of 3 to 4 degrees on each piece; its angle influenced by the improper mounting of the antenna wheel assembly. 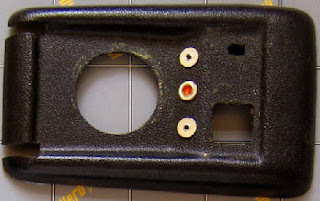 The contour of a jagged cutout in the black plastic shell by the left-side antenna wheel; allowing the wheel to be mounted to the midplate is virtually identical on the two pieces. Another interesting observation is that the screenshot communicator clearly has much less aluminum midplate showing in its upper left corner and side than my communicator; however, it is evident that the top plastic shell of my prop has been reseated (possibly twice) on the midplate for repair operations, as confirmed by the different colored remnants of glue which were present on it; so its original orientation on the midplate might easily have been less skewed to the right, and been consistent with the screenshot orientation. Very importantly, a correct repositioning of the shell to match that of the screenshot would necessarily push it up towards the top edge of the midplate, and all of the silver metal visible through the plastic shell cutouts for the wheels would be hidden when the communicator is posed correctly for the screenshot. It is further noted that the angle of incline of the brass antenna was not perfectly replicated between the modern-day and screenshot images of the prop – only the orientation of the shell was closely matched. This could easily explain the slight difference seen in the measured angle of the serrated antenna edgeline. 3 of these were not expected to be perfect matches to Omega Glory screenshot given variation in assembly observed between other screen-used communicators (Specifically, vertical offset of moiré bezel on top shell, width of microphone grill, and width of aluminum control panel plate). Technical Aside: Why the Communicator in the Kious Photo is not reconcilable to the Omega Glory screenshot. 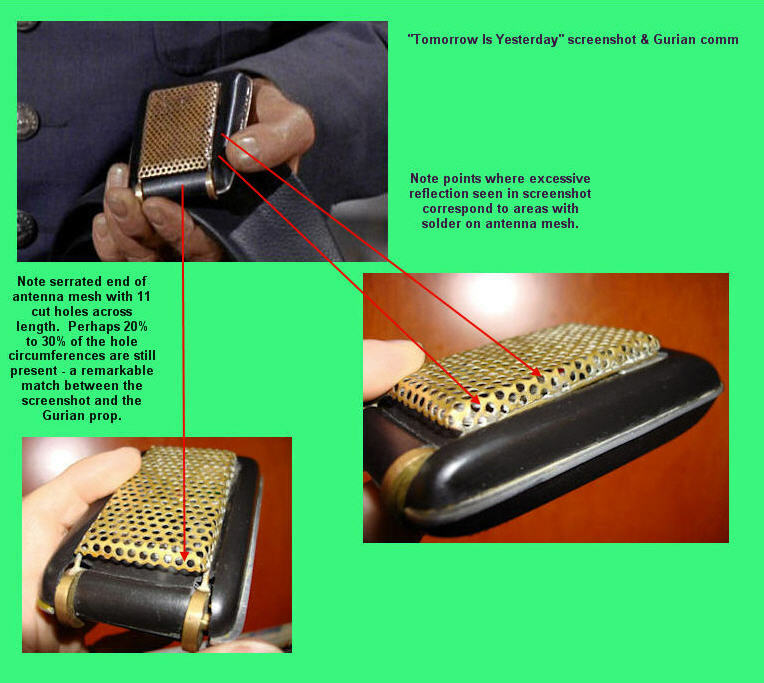 Some collectors might be aware of a well distributed image, speculated to be a 3rd season production outtake shot, of a different communicator featuring a slight “haircell” textured pattern on its black shell (versus a smooth surface vacuuform shell) and a similarly designed moiré pattern to that of the Omega Glory screenshot. This piece is shown below next to the Omega Glory screenshot. 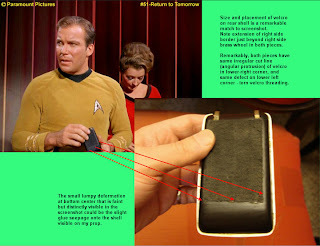 On detailed inspection, there are several fixed construction characteristics of the “Kious” communicator (the name by which it is known) which virtually rule it out as a candidate for the prop appearing in the Omega Glory scene. 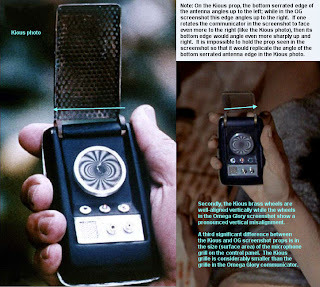 The communicator used in the Omega Glory screenshot, also believed to be the same communicator that is present in the additional TOS screenshots from “Tomorrow Is Yesterday” and “Assignment: Earth” displayed later in this article; appears to be a smooth body shell communicator. Well respected Star Trek prop expert Richard Coyle, who designed and created hand props for the Star Trek feature films, notes in a technical article entitled “Star Trek, Classic Communicators” on his website http://www.racprops.com/ that “There were essentially three body styles: the full textured; the lightly textured, which was a full textured body that was either well worn or intentionally sanded to nearly smooth; and last, the completely smooth body.” In the following composite image, I photographed a 1970’s era fully textured vacuuformed communicator from my collection at distances of approximately 1 foot, 2 feet, 3 feet and 4 feet from a digital camera with flash active to study the reflected light patterns visible on the patterned plastic shell. It seems quite evident to me that the fully vacuuformed shell, even when photographed at distances greater than that used in the Omega Glory and other TOS screenshots, demonstrated a striking splotchy pattern of reflected light with many noticeable “pin-pricks” or tiny concentrated points of high illumination that was markedly different than the smoother, more fluid reflective patterns seen in OG and other screen captures. The composite photograph below showing a splotchy reflective pattern from a textured communicator seen at a distance in the episode “That Which Survives” versus a fluid reflective pattern from a smooth communicator seen much closer to the camera in “Tomorrow Is Yesterday” - dramatically confirms my textured body photography experiment. The 2nd screenshot above, from “Tomorrow Is Yesterday”, is thought to contain the same TOS communicator prop that was photographed in the fully open position in the Omega Glory scene examined earlier. 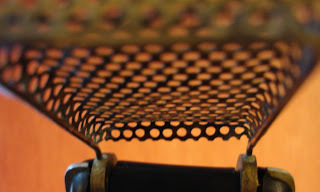 This view of the prop, upon a closer examination, also presents some remarkable matches in construction “fingerprints” to the Gurian communicator. The “Tomorrow Is Yesterday” prop has a unique light reflection signature on the left side of its brass antenna mesh (the right side in the screenshot) due to the presence of silver colored solder that was applied to hold the perforated mesh to the thin cylindrical rod that acts as the frame for the antenna. There appears to be 2 very distinct triangular-like patterns of reflection off of the solder in the screenshot that are perfectly matched by solder patterns on my communicator. Also, in the screenshot, the contours of the serrated top edgeline of the brass antenna mesh are clearly visible, showing exactly 11 cut holes with perhaps 20% to 30% of the hole circumferences remaining. This unique pattern is also found on my communicator. Note: The camera angles used above to capture the external solder and serrated antenna mesh edgeline on my piece make the entire antenna mesh design appear more box like than it truly is. In the photo below, one can get a better feel for the curvature associated with the transition from the top mesh to the sides. 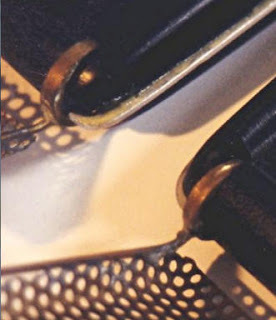 In the following picture of the inside solder present on the left side of my communicator, one can see a significant body of solder near the bottom end, some of which has in fact faintly migrated/solidified on the outside face as well – in a much reduced volume. This will also impact photography of the prop, though not in as pronounced a way as a mass of solder on the outside surface of the antenna mesh. A screenshot from “Assignment: Earth”, the final broadcast episode of the second season of TOS, is also part of the composite image below, and has the correct surrounding lighting to show what I believe is a slight discoloration on the mesh associated with the inside solder joint. Regarding the back side of the communicator, I believe the configuration of my prop is a very precise match, including some identical unique construction flaws, to the one seen in the episode “Return to Tomorrow”. When such minor assembly flaws discernible on a screenshot are matched so perfectly to a prop in one’s hand, it is indeed an incredibly exciting experience! Equivalently sized and placed Velcro backings. 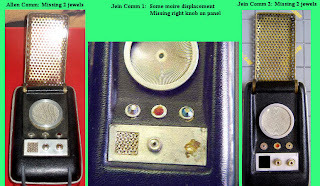 In summary, over the course of this article, my communicator was demonstrated to be dimensionally identical with another surviving TOS communicator prop (the Allen comm) with respect to the key vacuuform shell, brass antenna and other subcomponent size measures that one would expect to remain consistent between the pieces; and approximately 17 matches were found on my piece to TOS episode screenshots of communicators (both dimensionally and assembly related), some startling and unanticipated. 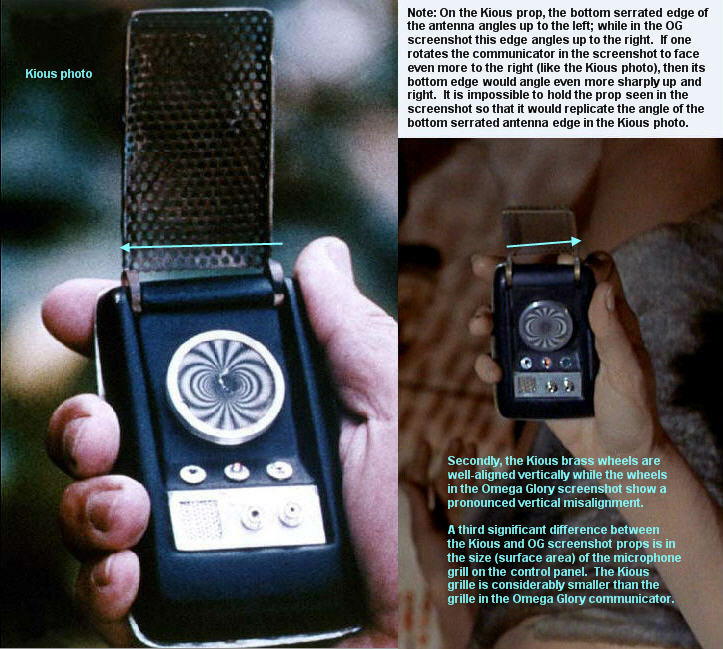 Several might even be deemed sufficient to establish a perfect match with a particular on screen prop; but together, all of the visual screenshot evidence and construction details observable certainly confirms, in my opinion, that my communicator is an authentic vintage Star Trek prop created by the same propmakers employed by Desilu on TOS. 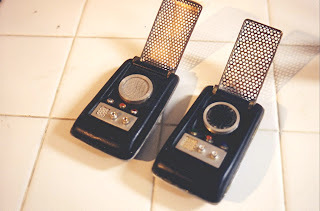 This article should serve to technically enhance the opinion offered by Set Decorator John Dwyer when this prop was photographed with the Allen communicator in his home that both pieces are original Star Trek hand props.